This Faire was to be four days long, with Wednesday as set-up day. I went up Tuesday evening to spend some time with some of the BYTE editors. Wednesday morning I went down to the Faire office. The press room wasn’t set up, but I hadn’t expected it to be. I went to exhibitor registration and asked for a press badge. Someone sent for David Sudkin. He listened for a mo- ment, said “Sure!” and produced a big red “TEMPORARY” badge. End of problem. I wandered in to talk to people. As usual, set-up day is a study in controlled chaos. The big companies like MicroPro, Apple, and IBM have professional set-up crews working with the local San Francisco exposition services people. The smaller outfits are on their own. At least they used to be. This year the unionized exposition troops were greedier than usual In the past they’d let a small booth owner carry his own stuff; this year they socked everyone for a couple of hundred bucks to let them unload their trucks. It’s a good racket: $200 to carry 10 boxes a hundred feet or so. It’s also a stupid racket, like eating the seed corn, because some of the smaller outfits won’t come back. Indeed, all day Wednesday the talk among exhibitors was that it was time to get the Faire out of San Francisco and into a friendlier city. More than half the exhibitors I talked with swore they wouldn’t be back next year. There were a lot fewer, anyway. That is; there was a lot of space rented. Not quite as much as last year: no one was on the garbage-collection platform, and the chair-storage area, otherwise known as the Black Hole of Calcutta, hadn’t been rented, but everything else had been, including the two side halls that used to hold seminars and speeches. Instead of lots of small exhibits, there were fewer, but much larger, setups. Three of the biggest were in a row: IBM, Apple, and Digital Equipment Corporation (DEC). Wednesday ended with the traditional “after set-up” party thrown by Compute! magazine. As usual, there were more press people than exhibitors snarfing up the hors d’oeuvres and free beer. We also noted that there was no exhibitors’ lounge: that location had been rented by Apple to let people get hands-on experience with Macintosh, or maybe it was IBM doing the same thing with PC and PCjr. The party was in the concession area—and unlike last year, there were no chairs and tables, just food service counters, with booths across a narrow aisle from them. I pitied the people who had those booths. When I left on Wednesday night, it was a scene of pure chaos. On Thursday morning, the miracle had happened again: everything was set up. I headed upstairs to the Workman and Associates booth for coffee. No coffee. The union people had not only forced Barry to pay for work he hadn’t needed, but they’d lost the box containing vital parts to the coffee maker. Mornings are not endurable without coffee: you might as well sack a city. Eventually I found some in the press room, but by then I was thoroughly prepared to make this my last Faire. At 11:00 the doors opened and the crowds came in. There were quite a few people. Not as many as we had on the first day last year, but a respectable number— and this was, after all, Thursday. Last year the Faire was only three days and opened on Friday. They were interested people, too. Fewer hackers—but a lot of customers. As I made my hurried cruise through the aisles, it seemed that more people were buying things. Barry Workman confirmed that when I got upstairs. There were a lot more serious customers. All the presentations were well attended, too. The panels for hackers and hobbyists had plenty of those, but the panels for newcomers and users had crowds, too. The “All Star” speeches, which featured Bill Gates, Gary Kildall, Bill Godbout, Steve Wozniak, Adam Osborne, and, somehow inserted into this rarified atmosphere, me, were all crowded with attentive people who asked intelligent questions. This was a serious crowd. By Thursday night it was pretty well confirmed: there were some glitches and justified complaints, but the new staff was trying hard to take care of the problems. This was a different Faire, but it was still a good one. Barry Workman sells a line of CP/M software, including WRITE, my favorite text editor. He had more sales the first two days than he did during the entire Faire last year. Others report the same, and that’s not just software vendors. The people at the Priority One booth had lots of business, and when they announced a big sale on CompuPro 40-megabyte hard disks (like mine), there was something approaching a feeding frenzy. Even vendors of computer furniture reported big sales. I expect there are several reasons for this. The state of the economy didn’t hurt, of course. More important, though, more people have microcomputers, so they’re ready to buy software and accessories. Whatever the reason, they were buying, and by Saturday night I could tell the exhibitors by their satisfied smiles. There wasn’t much new and exciting stuff. The best hardware wasn’t at the Faire at all: Richard Ohran, of Modula Computers Inc., was on a panel about Modula-2 with me. He brought a couple of the U.S.-built modifications of Niklaus Wirth’s Lilith computer, but they could only be seen in his hotel room. Naturally, I went. It’s wonderful. It has fabulous graphics capability, better than Macintosh or even the (alas, late and lamented) Diser Modula Engine, except that the Modula Computer Lilith has a Winchester hard disk and a 5 !4-inch floppy disk—much nicer than the goofy Honeywell-Bull “washing machine” hard-disk cartridge that came with the Diser. The Modula-2 panel was interesting, if a bit frustrating. Panelists were Ohran, Tony Gorrengourt of Logitech, John M. Craig, formerly of Diser and now with Ohran’s company, and Joel McCormick of Volition Systems. I’d been asked to be chairman: since I was going to the panel anyway, this gave me a good seat, although I didn’t have much to say. We had a good crowd, every seat taken: there’s a lot of interest in Modula-2. Tony Gorrengourt led off with a neat presentation on the philosophy of Modula-2. Then John Craig described the U.S. version of the Lilith machine. Joel McCormick promised that Volition Systems would get the 68000 native code Modula-2 compiler finished Real Soon Now. Richard Ohran described the public-domain Modula Research Institute compiler (for the IBM PC), which is available for $40. (Useful if you’re interested in Modula-2: alas, not really in shape for doing much practical programming.) We were also able to announce that in early March a group met in Zurich to form the International Modula Users’ Association, and we even agreed on some standards for the language and library modules. With any luck, we won’t have a proliferation of dialects and libraries the way things went for Pascal. One very hot item was Borland International’s Turbo Pascal, which was on a show special at $46.95, not much under the standard $49.95, but low enough to attract crowds. Borland’s president, Phillippe Kahn. was there to demonstrate his product and to talk with anyone who’d listen. He’s planning a whole line of products, all to be sold at under $70. Unlike most software publishers, Kahn tries to see how much he can include in his packages. For example, the PC version of Turbo Pascal comes with a nifty spreadsheet program—complete with source code. The source contains a number of screen-handling procedures I’d have been willing to pay separately for. I’m pleased to say Turbo was selling like mad. In case anyone has any lingering doubts, let me repeat: Turbo Pascal is as good a Pascal compiler as can be found on the micro market regardless of price. The new Turbo 2.0 for the PC has overlays, allowing you to write big programs. The integrated editor is a feature found only in really expensive compiler systems. Turbo Pascal is, as I write this, the only Pascal compiler that will work with the IBM PCjr. Not even IBM Pascal will do that! Besides, Turbo is much better than the Pascal IBM sells. Incidentally, Phillippe Kahn tells me that he tried to get IBM to market Turbo, but IBM wouldn’t do it unless he raised the price to at least $200. For reasons he doesn’t understand, he hasn’t been able to find anyone at Apple who’ll talk to him at all about getting it out on the Macintosh. (Borland doesn’t yet have a Macintosh Turbo. Pity.) Turbo Pascal is an example of where I see this industry heading: an excellent product, well documented and well supported, sold at a fair price. One reason many of us like Pascal as a programming language is that you can build up a whole raft of utilities—a box of software tools, if you like—and make use of them in many different programs. Blaise Computing—I suppose the name is derived from Blaise Pascal?— offers a set of functions and procedures for writing programs in either Microsoft or IBM Pascal. They include both string handling and screen handling. There’s a distinct possibility that using these could save a lot of time: it would depend on just how well done the tools are. They don’t support Turbo, alas, but source code comes with the tools, so it shouldn’t be that hard to adapt. I haven’t actually looked at what they offer, so I can’t tell how much they go beyond the routines given in Peter Norton’s book. One reason I like the West Coast Faire is that I meet a lot of old friends and make new ones. This year I met Doug Clapp, who has been, uh, kind enough to mention me in his columns. Clapp’s book Macintosh] Complete was, I think, the first one on the Macintosh to be published: alas, it reads as if it were rushed into print, and most of what’s in it is either elementary or full of goshwow! breathless awe of the machine. It wouldn’t be a bad beginning book, except for the price, which is pretty steep for what’s actually covered. A better Macintosh book is Cary Lu’s The Apple Macintosh Book, which goes into heavy technical detail but also covers a lot of elementary essentials. Like Clapp’s book, it assumes there’s going to be a lot of software for the Mac and that many of its problems will be solved. If you have to get your book out the same month that the computer appears, you’ll always have this problem, of course. Eventually there will be books written by people who have used the mature system: until then, Lu’s is certainly the best reference I’ve seen, and I recommend it to anyone who either has a Mac or is thinking of getting one. Alas, Clapp has a really bad case of Macworship: you won’t get an objective assessment from his book. Robert Tinney, the genius who does the BYTE covers, was at the BYTE booth with Susan, his wife. He was selling posters made from his old covers, and doing a pretty good business. He also took some photographs of me: he’ll be doing the cover to my collection of columns and reminiscences that comes out this October from Jim Baen Associates. While I was talking with Robert and Susan, I met Peter Norton, whose Inside the IBM PC is just plain excellent. The book gives lots of examples, in BASIC, Pascal, and even assembly language, but it’s written in a clear and intelligent style that neither talks down to the reader nor leaves out important information. Highly recommended for anyone with a PC or close PC clone. One of the most interesting hardware items was Micro Craft’s Dimension 68000 “Professional Personal Computer.” At CP/M East in Boston these folks had only one copy of the machine in their booth: now there were half a dozen, and they were selling them right there at the show: I noticed a couple of software companies buying, and Chris Rutkowski’s Rising Star, which is overhauling the Epson QX-10 software, seemed decidedly interested. The Dimension is supposed to run software written for nearly any 8-bit or 16-bit machine, including Apple, IBM PC, Kaypro, TRS-80, UNIX, and Osborne. The idea is that Dimension owners won’t have to worry about software compatibility: one machine runs everything. I’ve had no chance to examine the machine, so I merely report the company’s claims. Micro Craft had one set up with transparent cover, and it looked well constructed, but that kind of inspection isn’t worth much. It’s certainly an intriguing concept. 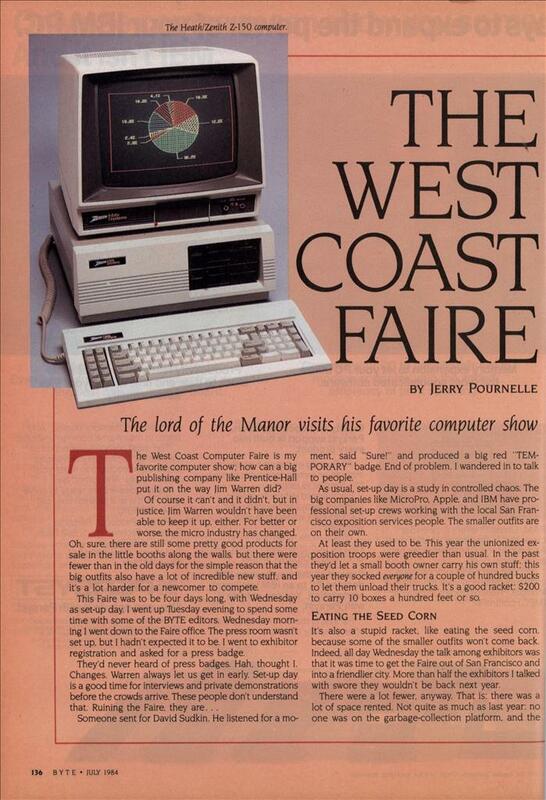 The most spectacular display at the Faire was Apple’s giant-size model of a Macintosh. This big Mac is large enough to walk into! The screen is a projection image of a nearby normal size Macintosh, so that crowds of people can watch Macdemonstrations, and it certainly drew the crowd. There were also several dozen Macintosh computers upstairs; those interested could make an appointment to go play with one for half an hour. Many people took Apple up on the offer, and they all seemed to come away with smiles. There’s no doubting it: the Macintosh is fun. I haven’t seen so much excitement since the very earliest days. In spite of all the Macexcitement, there was essentially zero applications software for the Mac. No one had any hardware to hang on the Mac’s I/O port (called a “virtual slot” in Macsales literature). There was a MacForth to be available Real Soon Now, and the FORTH people had a second disk drive—without a case—attached to the Mac. They’d apparently cobbled that up themselves; Apple wasn’t supplying second drives. Or perhaps they were blessed. Macintosh comes with Macwrite. a limited text editor, and Macpaint graphics-support packages. Apple expects outsiders to develop software for the machine. So far there isn’t much. Except for Microsoft’s Multiplan—which is copy protected on the Macintosh although the IBM PC version is not; presumably Macintosh users are less honest than IBM customers?—I saw only one other applications program for the Mac. That was at the Workman and Associates booth: Bruce Tonkin, software author, shared Barry’s booth. Bruce writes really complex programs in Microsoft BASIC (MBASIC). Actually, he writes in P-BASIC, which is a structured BASIC precompiler that compiles to, of all things, legal MBASIC. The P-BASIC compiler is written in Microsoft BASIC, so it wasn’t very difficult for Bruce to get it onto the Mac. He used it to write a highly complex database program called the Creator for the Macintosh. Guy Kawasaki, Apple’s Macproject head, was quite impressed when he saw it running. It’s a good program, not up to dBASE II, but good enough for a lot of serious business work, and it’s fast (even in interpretive Microsoft BASIC). That was all we found for the Mac. The machine has some limits, especially for serious business users. Lack of applications software is one major difficulty. A full discussion of this machine and what it means to the micro world will take more space than I have here and appears in this month’s column. Bill Godbout’s CompuPro company was proudly showing off the four-user Shirley; you’ll recall CompuPro had a mock-up of it at the last Faire. Shirley puts four computers in a single box and internally networks them; each user has a central processor and memory banks. The CompuPro folks announced that they’ll be using Datapoint’s Arcnet system to tie their multiuser machines together. This includes not only the Shirley machine (officially known as the “10”) but also the new machine based on the iAPX20286 chip. The 286s are pretty expensive just now, but they are available to software developers. CompuPro also had Concurrent CP/M 3.0 running on an 8/16 8085/8088 Dual Processor system much like mine. With four users and eight tasks, it worked, all right, but it was pretty slow. I’m much looking forward to getting Concurrent CP/M with windows running here, but I’ll never put multiusers on a single microprocessor. One user, at least one central processor; that’s the rule (mine, anyway). Digital Equipment Corporation had a large booth just next to Apple, but the people there seemed to have trouble generating any excitement. DEC is a company that has learned fast. When the people at DEC first brought out their Rainbow PC, they seemed determined to isolate their users from the rest of the micro world. The Rainbow wouldn’t even format its own disks! You had to buy them Preformatted. No more. Rainbow now reads lots of disk formats and runs all manner of outside software: DEC never tires of bragging about just how much. Like the Fujitsu, the DEC Rainbow has both 8-bit Z80 and 16-bit 8088 microprocessors and can run CP/M-80. CP/M-86, and MS-DOS software. It’s a pretty machine, with a good display—and very nearly the same wretched keyboard as the IBM PC. Since the IBM designers have said in interviews that they just sort of “made up” the IBM PC keyboard, I wonder why DEC’S salespeople insist theirs is some kind of European standard? The Rainbow deserves more attention than it got: being next to the overcrowded Big Mac display must have been pretty grim for the DEC booth people. As I’ve reported in previous columns, we have a Corvus Concept computer. It implements Corvus’s Omninet system, which lets us link up an Apple, IBM PC, Zenith Z-100, TI PC, and CompuPro S-100 bus system so that they can’all share the Concept’s large hard disk. The only person I “know” at Corvus is a software engineer named David Ramsey, and I’ve never actually met him: we’ve corresponded and talked many times on the phone. When I spotted the Corvus booth at the Faire, I headed right for it. A rather pretty young lady with blue eyes was the only person visible. “Is David Ramsey here?” I asked. Alex was later told the same thing. This makes me more anxious than ever to meet him. Corvus has made some changes in its system. For example, our Concept’s hard-disk unit is very large, about 1-1/4 times as wide as an 8-inch disk drive and a little taller. This size is a hangover from the days when they shipped 8-inch hard-disk drives some years ago, since the drive inside is a 40-megabyte 5-1/4-inch drive. Corvus showed off a new hard-disk drive at the Faire. It’s only a little larger than the 5-1/4-inch hard disk it contains. The new model has the Omninet interface built in—ours has a separate unit, about 1-1/2 times as high as a half-height 5-1/4W-inch disk drive, to connect it to the Omninet. Believe me, the amount of space taken by these drives is large, so I was happy to see these improvements. Mr. Ramsey swears he’s coming down to Chaos Manor to oversee installation of the new and improved system, run twisted pairs of Omninet wires around, and in general improve on communications here. I’m much impressed by the Corvus; I keep hoping the company will mate that big bit-mapped screen to the Modula operating system, but Corvus says it has something even better, or at least as good, which Ramsey will show us when he comes. I’m prepared to be impressed. 1 just hope they take the chains off before they let him come. PC-Write is a full-screen text editor that makes use of many special features of the IBM PC. I haven’t tested PC-Write, but I’ve seen enough of it to know it’s a pretty good editor—especially for the price. You can get it for $10, or even for free. PC-Write is distributed as “Shareware.” What this means is that you can buy a copy from the publisher for $10, but that’s not the principal means of distribution. Anyone who has a copy is encouraged to give copies to all his friends. The program and its documents are all on disk, so this is quite feasible. People who get the program and like it are requested to send $75 to Quick- soft, the program’s publisher. When you send in the money, you get a printed copy of the document—a marginal improvement over what’s on the disk—and an “official registration number.” Put the registration number into your copy. Now, when you give copies away, if anyone you’ve given it to sends in the $75, you’ll get a $25 sales commission. Quicksoft’s Bob Wallace says the company’s not doing too badly. A number of people have liked the program enough to register it. He’s meanwhile writing new programs to distribute this way. I don’t know whether the “shareware” concept will catch on. I encourage the trend. One program I’m likely to use often has the odd name of Tutsim and comes with a picture of an Egyptian pharaoh. I presume he’s King Hit. I have a copy, and when I get a chance I’ll wring it out; meanwhile, I saw it work at the Faire, and it was impressive. Tutsim solves differential equations. It does this by turning your computer into a kind of analog device: that is, you can simulate the various kinds of operational amplifiers some of us older types remember from days long ago. Once you have the analog model set up, Tutsim solves the equations and produces the graphical results. This probably makes little sense to some readers. Don’t worry about it. I’ll have a lot more in upcoming columns. Tutsim looks to be a very practical engineer’s toolbox, and anyone who has to work with, or teach, differential equations should write Applied i for more information. It might be exactly what you’re looking for: certainly it was one of the most unusual items I saw at the Faire. I don’t recall Rana Systems being at the Faire before, but I may simply have missed it. Since the last show, I’ve met Fran Mulvania, Rana’s director of communications, and we have installed Rana systems, so I tend to notice the company more. Anyway, the Rana folks were out in force this year with a variety of products. Their flagship item remains the 2.5-megabyte floppy disk that so im- pressed me last year at NCC. They also make a full line of disk drives for Atari and Apple computers. I’ve used them, and they’re faster and more reliable than the ones Apple and Atari supply. Rana’s monster floppy-disk controller goes into a standard IBM PC slot. It can control standard floppy disks as well as 2.5-megabyte drives (good for an overcrowded PC). I’ve been using 1.1-megabyte 8-inch floppy disks for some time now, and every time I have to work with smaller disks I miss the big storage capacity. It would be a weird experience to have 5-1/4-inch disks with a greater capacity than my 8-inch disks! Rana will shortly have the 2.5-megabyte disks for Apple IIe systems as well. We expect to get one pretty soon. Full report then. Suddenly a lot of people were wearing buttons that said “Osborne is back!” However, if you read the fine print it wasn’t so certain. The people at Osborne had a booth, not as large as the ones they had in the salad days, but large enough and complete with balloons. (Interestingly enough, Kaypro. which is the entry-level system I most often recommend, was in the booth Osborne occupied last year.) The Osborne people had videotapes of Adam Osborne himself telling how wonderful the Osborne computer is. They even had a bunch of computers that looked like the old Executive, until you got close to them. What they didn’t have was order books. No computers were for sale, and no price for the new Osborne PC has been established. This Osborne is different enough from the ill-starred Executive to warrant calling it a new machine. They say it is definitely PC compatible: I saw it run Flight Simulator, which is the program people often use to test PC compatibility. Otherwise, the machine looked a lot like the older Executive. There are a lot of differences, though. There’s an RGB (red-green-blue) color board adapter, an expansion chassis, and a socket for the 8087 math chip. At last year’s Faire. Osborne had patches with the big “barred O” symbol and the words “Osborne—teaching others to be humble.” There weren’t any of those patches this year. As usual, Zenith took one of the largest booth areas of the Faire. It doesn’t look all that big, because the folks at Zenith always invite certain people to share it with them. For example, Jim Hudson, whose 8087 math board greatly increases 8086 machine capabilities, was there. Jim was showing off his 8087 boards for the Z-100 and the CompuPro. The Z-100 board is especially ingenious: it’s an S-100 board with 256K bytes of RAM (random-access read/write memory) and the 8087 both aboard. The 8088 goes on his board, and a header plugs into the motherboard where the 8088 went: the memory connects to the S-100 connector and gets all the decoding and so on there. The Hudson board has a lot of bang for the buck. Walt Bilofsky’s Software Toolworks also shared quarters with Zenith. The Toolworks has changed a bit. Instead of Insta-press flyers, Walt has a big color catalog printed on slick paper. The logo of the blacksmith forging a floppy disk on an anvil is gone, too. For nostalgia buffs, he still distributes software in Ziploc sandwich bags though. The Software Toolworks used to specialize in Heath/Zenith software, and the company still has a lot for those machines, but most of what I got from Walt this trip is for the IBM PC. I’ll report in a later column: meanwhile, those who don’t know about the Toolworks ought to get a catalog. Bilofsky sells good stuff at remarkably low prices. The MPI printer people were also in the Zenith area. Zenith now sells MPI printers. So does Heath in its catalog. The printers say “Zenith” on the outside, but the catalog lists them as MPIs. Pretty honest. I’ve written about the line before: we have four MPI printers, and we’re happy with them all. The Zenith Z-150 ZPC is its entry into the IBM-compatible arena, and it’s an impressive one, so much so that my first thought is that this is probably the PC clone to buy if you want one. We’ll be getting one shortly—full report then. It sure has a lot of nice features. The Z-150 is a desktop, smaller than the IBM. It seems to run everything that the IBM will, right out of the box. We watched Bruce Tonkin put his MyWord word-processing program in the Zenith and run every feature. Rachel Klau, a programmer for Heath, said that people came by through the entire show and ran all their favorite IBM programs without fuss, muss, or bother. While she was saying this, a group of people came over and ran their newfangled 2-D structural modeling program on it. They all applauded when it ran and went away saying that it worked better than on the IBM PC. After Rachel had relaxed (they were still batting 1.000 on IBM compatibility), she told me that the Z-150 was designed from the start to run Microsoft’s Flight Simulator, which is in some ways the very best test of IBM compatibility. It’s certainly the only IBM compatible that you can build yourself. If you’re skillful with tools and soldering iron, you could save yourself a lot of money. The folks at Zenith showed a prototype of their “portable” (33 pounds!). Alex says it’s one of the funkiest machines ever built. It’s portable in about the same sense that a 19-inch TV with a handle is portable—with great care you can get it from room to room, lb be fair, the Compaq weighs 32 pounds and the IBM portable 30. Both the table model and the “portable” have eight IBM-type slots and an 8087 socket, and both run at the same speed as the IBM PC. Given the company’s quest for absolute compatibility, that’s no surprise, but there is no speedup switch or anything to let the Z-150 cut loose on its own, and that’s a bit sad. Still, the machines seem to run absolutely everything that people tried, including MS-BASCOM (Bruce wrote MyWord in BASCOM). The Z-150 uses two half-height 5-1/4-inch drives. You can get it with a hard disk, which takes the place of one of the floppy disks. Since it’s a full-height hard-disk drive, it sticks down into the cabinet below where the lower half-height drive would normally go. Very slick. The detached keyboard doesn’t have quite as nice a touch as the Z-100’s keyboard, but it’s better than most. The keyboard has moved all the “wrong” position keys on the IBM PC to more reasonable places. It has lighted LEDs (light-emitting diodes) for Caps-Lock, Num-Lock. and Shift-Lock keys. This is definitely a “Heath/Zenith” machine, in that order. It was developed in St. Joseph, Michigan (Heath’s headquarters) by Heath employees. The Zenith Z-100 was developed by Zenith, though of course Heath is famous for its kit versions of computers—including the Z-150 ZPCs. Kit versions usually bear the Heath name and fully assembled ones the Zenith name. The Z-150’s main claim to fame is its color board. It seems 100 percent compatible with IBM color programs and is by far the best PC clone color board I’ve ever seen. If the folks at Zenith want to sell this board to IBM owners, they’ll make a mint. Unlike the IBM, which blinks horribly every time a line is scrolled, Zenith’s has (settable!) smooth scrolling that looks good with both graphics and text. In addition, I heard rumors of high-resolution color boards in development. Don’t be surprised if the first one looks a great deal like the Z-100’s color palette. One other twist: there’s a built-in debugging tracer in ROM that you can access at any time. It shows you what code is being run, what’s on the stack, and what’s in the registers. You can get to it as long as the machine is listening for interrupts; if not. you’ll have to turn it off and on. The lack of a real reset switch, one that always works, is the major blemish on an otherwise nearly perfect machine. Incidentally, don’t expect Zenith to suddenly phase out the Z-100 in favor of the Z-150. This is the same Heath that will sell you a knob for a 2 5-year-old kit tuner out of its warehouse stock. If the company’s reputation won’t convince you. the sales of the Z-100 should: GSA, the Army, Navy, Air Force, and UPI have all bought more than 5000 each of these machines. It’s likely to be the machine at the Air Force Academy. The Z-150 is to get Zenith an entry into the market of PC clones, not because Zenith wants to dump the Z-100. A small company looking for a machine to develop PC software on could do a lot worse than buy the H-Z150 kit. Speaking of the Navy, I talked to two sailors, one from the Enterprise, the other in an LHA helicopter carrier (or Large Hotel, Afloat). Both had Z-100s onboard—there are 23 on the Enterprise. Both complained that the power supplies tended to burn out on the Z-100s because of the spikes in shipboard power. Otherwise, they are extremely happy with their Z-100s. Considering that most big shipboard navigation and fire-control computers have just been upgraded to 64K-byte core (!) memory, I can see why! It isn’t generally known, but the BB New Jersey still uses big mechanical analog integrators for fire control. A Z-100 with a good power filter would be a lot more machine…. There was a great deal more to see. including a Japanese import color system using a light pen to do in 265 shades of color what Macpaint does in black and white. The FORTH people handed me a thick stack of books and program disks that are supposed to produce the brand of FORTH described in Leo Brodie’s excellent introduction. Starting FORTH. MicroPro has a new 16-bit spelling-correction system called CorrectStar. It has more features than The Word Plus, which I use at present, and I liked it quite a lot; I’ll go into more detail on that in my next column. There were a lot of good speeches and seminars, all well organized. Despite a few glitches, the new Faire management team kept things running far more smoothly than I would have believed they could. Final attendance was a bit over 40,000, down from the 48,000 of last year, but good enough, especially since so many people bought merchandise. It’s still my favorite computer show. I ‘m not much impressed with the IBM PCjr, so 1 would have ignored the IBM booth, but the folks there had big signs proclaiming their new “network.” This looked interesting, and 1 sent my son Alex off to investigate. Here’s his report: “IBM showed off a new product to tie the PC. PC XT. PCjr, and Portable PC together. It’s not a network. It’s a ‘channel arrangement: I’m not sure what that is. I can tell you what it is not: a real network. With a raw communication speed of 375K bits per second (bps) and only 64 users maximum, it’s not going to compete with Ethernet, Omninet, or Arcnet. lb compare. Arcnet and Omninet run at about 1 million bps and Ethernet at about 10 million bps. Those are raw speeds, not equal to the amount of data that can really be sent. Nonetheless. I think the low speed alone means it won’t do well, even with the IBM name on it. “Data is carried on a 75-ohm coaxial (TV) cable. You put a Tee in for every station; that Tee cable can be about 16 feet 15 meters) long. The distance between the farthest stations can be only 1000 meters at most, so IBM’s channel arrangement’ is good only for pretty local communications to start with. “There are some other problems. IBM doesn’t even support all of its own machines: 1 specifically asked, and no. the company doesn’t support the PC XT/3 70 on this net. Nope, no way to hook up to its own mainframes or non-PCs. Only 10 megabytes can be shared on line: the folks at IBM don’t even support multiple hard disks! They said you cannot put a second XT hard drive on the channel. “There’s no true file sharing or record locking (goodbye, shared databases). No DMA (direct memory access), which means that each byte must go through a register (rather than being transferred directly into the receiving machine’s memory). This omission is ostensibly because the PCjr doesn’t support DMA. (I think that last point is a nail in the coffin of both the jr and the channel arrangement.) “The IBM employees I talked with stressed how you could run the PCjr with no disk drives by doing an ‘IPL’—an old IBM mainframe term meaning Initial Program Load—from the net. making the PCjr a diskless workstation. Perhaps they are attempting to crack the school market with this? This might work if it didn’t require a hard disk, but in fact the ‘channel arrangement’ does require one. I could see a bunch of PCjrs being fed by a single PC XT. but I see no cost savings over PCjrs with a disk. First, you must buy IBM’s board and software ($400 in quantity), then you must buy a central PC XT ($5000 and up). A PCjr’s extra memory and disk drive are only $600: that’s an awful lot of PCjrs to buy to get a cost savings—and there’s very little school software for the PCjr right now. I used to love reading Jerrys columns in the 80s. It is also interesting that the “big three” vendors at the show were Apple, Microsoft and CompuPro. The first two are still very much in evidence: the third I don’t remember seeing even when I started reading Byte in 1988. CompuPro was probably the last of the big S-100 bus computer manufacturers. When Compaq cloned the IBM ISA bus with 8086 processor it pretty well killed the market for S-100 computers. 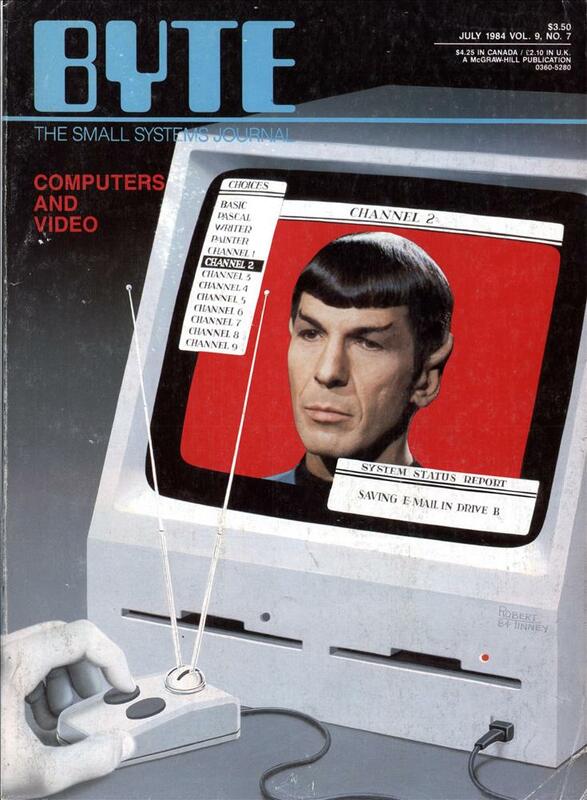 I love the cover of the magazine with Spock on the computer. That was some good foretelling of the future.